MAPS believes very strongly in Consumer Protection. At MAPS, we ensure that consumers are dealt with professionally, courteously and sympathetically by our members. Any products supplied by MAPS members must be fit for purpose, installed professionally and come with comprehensive workmanship and product guarantees which are underwritten with specialist insurance. This provides consumers with a high level of protection. MAPS provides consumers with a national network of suppliers and installers. 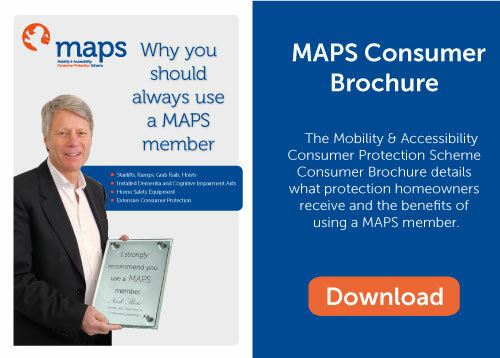 Just look for the MAPS Accredited Member logo when purchasing mobility & accessibility products. Use our easy Find a Member form to locate MAPS Members in your area and find the right company for your requirements.